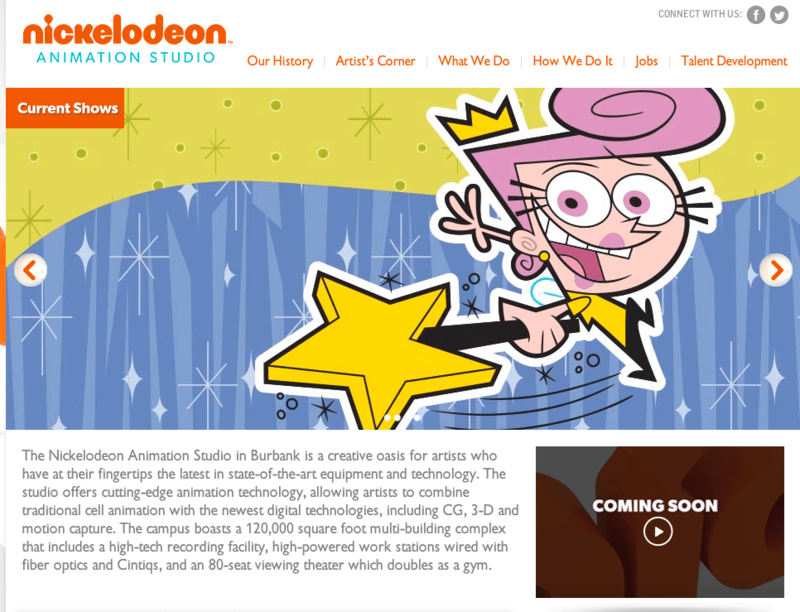 Nickelodeon has premiered a brand new Nick Animation Careers website and it’s pretty cool. Straightforward and easy to navigate, this will be I imagine the spot to check what’s going on there as far as new gigs. It’s a lot easier than the old way in my opinion. It also highlights internships and how to go about applying for that, as well as a new Talent Development section where they outline the Artist program and Writing programs which many great industry people have emerged from. All in all I think it’s a great step forward for seeing what Nick has to offer to help you shape your career in animation! The motive is that my CV is over 200k to up load on, and my website is under re-construction. I’m slowly working on it trying to decide what to put in or take out making changes etc. But If it’s any help to you – I like to offer you a summary of my demo reel it can be viewed at the following location. A brief note on my experience. I am a uniquely skilled and highly effective industry professional with 25 years worldwide experience, covering all facets of film/ television production, post production, workflow management – from award winning assignments to smaller retail productions that require ingenuity and flexibility in planning and budgeting. I also have broad and extensive production/post-production experience in all areas of media creation, from conceptual vision and consultancy, through to execution and visual effects. With extensive experience in drama, Animation / VFX television – feature films development from pitching concepts to writing full drafts. I am proficient at generating original ideas in a multitude of genres while having the script editorial experience to solve story/structural issues. I am able to assess submissions and give constructive coverage as well as function effectively in diverse and challenging circumstances worldwide with excellent communication skills. I can also create a coherent working environment, coordinate services and manage personnel to meet deadlines in all conditions across a spectrum of media options and delivery platforms. I am passionate about all forms of media and a multi-tasker who embraces rapidly changing technology. I am disciplined, calm, dedicated, innovative, tenacious and articulate. One of the biggest mistakes I consistently seen other producers and filmmakers make is forgetting that they are creating a piece of intellectual property, and without proper marketing, logistically sound planning and good financial sense it will just remain an expensive piece of art. I strive to marry that art with commerce on behalf of my investors. I create projects that they can, artistically speaking, be proud to say they’ve been a part of, and financially speaking, they can feel secure about having done so. It is of the utmost importance for me to continue to maintain my high level of integrity. I am looking to build profitable long term relationships that last. Any comments would be grateful. Just so you know Alfred, to apply for the job you have to click the link. This site has nothing to do with Nickelodeon or the job they are offering.